Baseball Bats .... Is Your Bat Just Right For Your Hitting? Baseball Bats are the real tools of the trade for skilled hitters' therefore it is important to select and use a bat which is quality and above all else "feels just right." Do you want to find out some interesting data about this important tool for hitters? who have the (1) eye-hand coordination of a practiced surgeon with silk smooth (2)body control, (3)super bat control, (4)whistling speed swings, with powerful forearms of a steel driving man, (5)wrist snaps timed like a jack hammers blow as the bat meets the ball. The bat,in the hands of a hitter with focused concentration, is always cocked and ready when the hitter is in the batters box. Choose to use the bat "which feels just right" and make it your personal and constant friend to get the job done when stepping into the batters box. Because bats of all lengths and weight were being used, a rule was made in 1859 that bats could be no larger than 2.5 inches in diameter, although they could be of any length. Ten years later in 1869, another rule was added that stated the baseball bat could be no longer than 42 inches in length - the same maximum length allowed today. In the 1890's, the rules committee stated that bats could no longer be sawed off (flat) at the end, they must be round, and the maximum diameter was increased to 2.75 inches. 1900, Hans "Honus" Wagner, one of the early and yet great players of all time, became the very first player to be paid to have his autograph burned into the Louisville Slugger bat. Wikipedia, the free encyclopedia provides us a pure definition for all intents and purpose of what it is and its purpose? Baseball bat is a smooth wooden or metal club used in the game of baseball to hit the ball after the ball is thrown by the pitcher. It is no more than 2.75 inches in diameter at the thickest part and no more than 42 inches (1067 mm) in length. It typically weighs no more than 33 ounces (1 kg). The batter uses the bat two-handed to try to hit a pitched ball fair so that he may become a runner, advance bases, and ultimately score a run or help preceding runners to score. A baseball player will choose his youth baseball bat with special and particular care for weight and feel he prizes it as one of his most personal held possessions and he takes excellent care of it as if it had the feelings of real life kinship What makes your baseball bat unique or special? You tell me is it the name brand? Is it the signature model stamped on the bat? Is it the slender thinner handle? Is it the color? Is it like the one your baseball hitting hero uses? Popular Brands but more specifically the maple wood bat which is becoming a huge favorite is Annex wooden baseball bats. They are created from the finest sugar maple billets in North America and are proudly made in the U.S.A. They offer the most popular wood bat models for a flat out low price. Annex wood bats are cut from premium maple wood, the same wood Big Leaguer's use in the game today. WORTH ---- RAWLINGS ---- MARUCCI ---- COMBAT As baseball players and fans around the world the grandaddy or the most familiar name associated with baseball bats through the years was the Louisville Slugger. Now in today;s baseball games you see plenty of the metallic Easton baseball bats. Now with such an array of bats available both the honored wood bats and now the proliferation of mass produced aluminum or metallic bats it is time to go back to finding the wood bat which is considered "This is my bat (we are a team my bat and I) there is none other like it and I am really proud to have my Annex Bat it sure makes us a hitting team." The choices of wood bats or aluminum bats Aluminum vs Wood Bats. which is "just right" now in our today's modern era of baseball could be a matter of much controversy. All of this baseball-bat stuff referring to baseball-questions-answered can only be given by the user of the bat it is his/her baseball bat and it feels "just right" and he/she readily will let you know, "It is mine." The aluminum bats or wood baseball bats is an issue, from the Tee ball to the College level, and players must go with the flow and use or choose the type bat recommended by his playing league rules. Now this Aluminum vs Wood Bats is of concern but a small matter of baseball terminology BESR Bat Certification also becomes part of this aluminum-bat selection process. The baseball hitter uses his baseball bat as the weapon of battle in a baseball game for it is a battle of wit and skills of the hitter against the cunning and artful skills of the pitcher. Our beginner baseball players use youth-baseball-bats measured in size length and weight to be best used for young beginner baseball players. The very earliest wood bats were nothing more than flat boards cut out tapered handle. Then we got the squared off chunks of wood semi-rounded smooth but still having a flat side. My goodness how our baseball equipment has evolved. Forget all the archaic thoughts of cave man design. We now enjoy the perfectly machined wood-bats and even have at our disposal space age metal-bats. What a day this game of baseball and the development of our weapon of choice or referring to our wood-bats as a piece of timber have brought us. You see our game really is a friendly battle of team against team and each hitter against the pitcher. Baseball playing and the use of baseball bats in a game played within a baseballfarming farm system we now know and call it what it is "baseballfarming" which has fully matured and is in fact a universal sport being played around the World. Using a baseball bat and a baseball the opposing teams do battle for nine innings of play to win. Oh! how true, "The thrill of victory and the agony of defeat." It truly is a battle out there on the diamond with the pitcher and hitter going at it toe to toe for one ups-man-ship to determine who wins. The hitter has the wood or aluminum bat and the pitcher has little rock called a baseball which he has taught English and he will make it talk. I suppose the feller who wrote the song "If I had a Hammer" I'd hammer out Justice and Freedom could do well if he put together the words to music for a tune "If I had a Bat" I'd Hit my way to Stardom. A players bat is such a vital piece of baseball gear for getting the job done and winning in the game of baseball it surely should be portrayed and remembered in song. A players baseball-bat is his own very personal choice there is a kinship between this inanimate object his baseball bat and the living human touch as a baseball hitter. 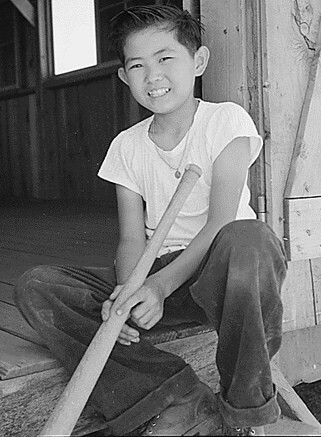 Young boy pictured below is very proud of his bat you can tell by the smile on his face. Put a smile on your sons face click on the picture and shop for a bat for your son. Hey good buddy do you need to buy your son, daughter, nephew or niece a real quality athletic equipment or merchandise of value and quality baseball sports gear shop first at your One-Stop Center. Time changes most things even our old standard Louisville Slugger baseball bast may even have a ping to it now instead of the loud crack we grew to love as a young hitter. George Brett and the "Tar Baby" baseball-bat. A very interesting incident occurred with the use of a bat and even caused enough stir to have rule changes. The Free Encyclopedia draws a very good account of the incident. According to Rule 1.10(c) of the Major League Baseball Rulebook, it is not allowed more than 18 inches up from the bottom handle. An infamous example of the rule in execution is the Pine Tar Incident on July 24, 1983, when Kansas City Royals third baseman George Brett was called out after hitting an apparent home run, because after comparing the length of the pine-tar treated area to the width of home plate (17 inches), the umpire determined too much of the baseball-bat was covered with pine tar. At the time, such a hit was defined in the rules as an illegally batted ball, the penalty for which is that the batter is declared out according to Rule 6.06. Nonetheless, at the time, the out call was challenged and overruled, and the game was resumed on August 6, starting after the now-upheld home run. Rules 1.10 and 6.06 were later changed to reflect the intent of Major League Baseball, as exemplified by the Commissioner's ruling. Rule 1.10 now only requires that the bat be removed from the game if discovered after being used in a game; it no longer necessitates any change to the results of any play which may have taken place. Rule 6.06 refers only to bats that are "altered or tampered with in such a way to improve the distance factor or cause an unusual reaction on the baseball. This includes, bats that are filled, flat-surfaced, nailed, hollowed, grooved or covered with a substance such as paraffin, wax, etc." It no longer makes any mention of an "illegally batted ball." This George Brett action was a tempest in a teapot compared to the skulduggery acts of professional players doing the unheard of action of using a corked bat. Corked baseball bat is the drilling or hollowing out the barrel of a baseball-bat inserting lightweight material filling such as cork and replugging to be undetected. Yes folks! you are right the weapon of battle in a baseball game is the baseball-bat. Why a corked bat? The lighter weight bat allows the hitter to generate significant more bat speed with his swing and this added bat speed is what makes the baseball leave the bat like a blast from a cannon. Your bat of choice will have the right feel for there is none other exactly like it. Your favorite bat of choice may not have been new it could very well have been a used baseball-bat. Whether you play Little League baseball or for a college team, buying your baseball bats is a personal decision. New technology has delivered bats which enhance performance but also are tailored to an individual player's strengths. Select a bat which fits your skill level with consideration of your unique physical body height, weight, and hitting strength. A Player's Bat...is equivalent to a soldier's rifle! Every baseball player when stepping into that batters box should be willing to do battle. It is him against the pitcher. Be it hickory, oak or made from ash or maybe even hard maple any bat when it feels right in your hands it was the one you will choose over and over again when you go to do battle with the pitcher and little white baseball. Today's game of baseball at the college level and below finds space age technology filling our ball diamonds and Fields of Dreams with the metal or aluminum bats. It was simply a matter of time before use of the metal bats will require new bat specification standards. Louisvile Slugger captured the pinnacle of wood bats making history with their Louisville Slugger which was started well back in 1884. The white ash bat made by Louisville Slugger was the rage of the age replacing the predominance of oak and hickory baseball bats being used up to that time. For lo those many years until 2007 and the the year of "The Big Chase" when Barry Bonds erased the Home Run leadership from Hammerin Hank Aaron using a hard maple bat. Now isn't that some record bursting event, surpassing the exploits of another mortal, while using an inanimate history making piece of maple wood called a baseball bat. The Great Bambino Babe Ruth slugged a total of 714 home runs swinging a Louisville Slugger baseball bat. Hammerin Hank Aaron caught and surpassed The Babe hitting 755 round trippers again the Louisville Slugger was the king of the diamond best baseball bat of choice and swat fame. Barry Bonds using his hard Maple might well be called the best baseball bat which did the virtual impossible feat of slapping 762 little white baseballs over the fence and out of the ball parks. Since bats are immune to the frailty of thought or purpose they only come alive in the grip of the user. Baseball and the bats used are as varied as the species of man. bat care because he takes his trusty battle stick to battle against all pitchers. Enough already on the philosophical bit about baseball-bats lets shuck down the corn and learn some real aspects and the purpose of choosing your bat of choice. To understand some of the finer tips and and characteristics of baseball-bats you need to know many things bat signature logos and the differences are as varied as the changes in wind direction. When finished with your lessons or introduction for baseball bats you will be armed with enough general knowledge to select just the right size weight and length of baseball bat. Like Little Bear which visited Goldilocks home in the woods and trying out various items you will find the one baseball bat which is just right. NCAA and high school rules prohibits use of baseball bats which are more than 3 ounces lighter than the bat’s length in inches. When it comes to length of the baseball-bats for kids, the rules state that Little League baseball-bats must be less than or equal to 32 inches in length. Their barrels cannot be more than 2.25 inches in diameter. Kids playing in leagues of the (age 7 to 8) you don’t want to exceed these limits. A length of 26 to 27 inches will do. For the Little League Junior Minors (age 8 to 9), try 27 to 29 inches. For Senior Minors (age 9 to 12), try 28 to 31 inches. And for the Little League Majors (age 10 to 12), you should buy and use a baseball-bat anywhere from 29 to 32 inches. Nice selection of aluminum-bats or wood-bats at many of the baseballfarming merchants and sporting goods shopping ads--- browse around and find what you want. You might have a hankering to visit directly with some of the folks that make and sell baseball-bats. Baseball bats are made in the United States and other countries by bat companies and sold around the world. Annex Baseball; Louisville Slugger; Easton; Worth; Wilson-Demarini Bats; Rawlings;Mizuno; Mattingly Bats "The Mick" a baseball great was a switch hitting power slugger who could run like a deer even with taped knees. Commerce,Oklahoma gave the New York Yankees and all of us "The Commerce Kid" signed right out of high school and played his entire career with the Yankees. "Micky Mantle learned well as a youngster how to use his bat to power all of my hoss-hide cousins slap out of the ball park."